In May 2009, Yokogawa announced efforts to promote international standardization and dissemination of the ISA100.11a wireless communication standard of the International Society of Automation (ISA) for industrial automation, and in June 2010 Yokogawa released the world's first wireless field instruments and a device for wireless systems based on this standard. This report describes the concept of field wireless solutions and field wireless systems based on ISA100.11a, including Yokogawa's CENTUM VP distributed control system (DCS). The specifications of the ISA100.11a1 wireless communication standard of the International Society of Automation (ISA) for industrial automation were published, and companies are developing products based on the standard. The ISA100.11a has many features such as high reliability including redundancy, network scalability, and support for various protocols for industrial automation. Yokogawa set VigilantPlant2 as a vision for control business for realizing ideal plant operations for customers. In order to create an environment for customers to be able to select the best field devices, based on this vision, in May 2009, Yokogawa announced efforts to promote international standardization and dissemination of the ISA100.11a, and in June 2010, Yokogawa released the world's first wireless field instruments and a device for wireless systems based on this standard. This report describes the features of the ISA100.11a standard, the YOKOGAWA Group's efforts to disseminate this standard, a concept of commitment to wireless communication in the future, and building of field wireless systems including Yokogawa's CENTUM VP distributed control system (DCS). Communication between field devices and control systems started with 4-20 mA analog communication, and then has evolved to hybrid communication such as Brain Note 1) and HART Note 2), to digital communication such as FOUNDATION Fieldbus Note 3) and PROFIBUS Note 4), and finally to wireless communication represented by the ISA100.11a. Hybrid communication and digital communication has significantly increased the amount of information that can be used for plant operations, and innovated instrumentation. Asset management, preventive maintenance, etc. have been realized based on extensive information such as multiple process values and diagnostic results, which is sent from devices to upper systems such as DCS and assets management system. Field wireless technology that enables wireless communication between field devices and control system will bring further advanced innovation of instrumentation. Field wireless communication has many advantages, such as the ability to reduce wiring and engineering costs, ability to install devices in a place where wiring is difficult, and easy work of device adding and removing. By making best use of these advantages, it is possible to carry out instrumentation that makes possible things that were impossible before. The wireless technology continues to evolve, and instrumentation that makes best use of wireless communication will also continue to evolve. In order to promote the ISA100.11a wireless communication standard for industrial automation in a comprehensive manner, the ISA100 Committee has set up working groups (WGs) for specific purposes, which consist of members not only from vendors but also from many users with no restriction for the participation, and are working on developing standards in an equitable manner based on user requirements. The WGs include a WG that develops the specifications of the ISA100.11a standard, a WG that defines a way to coexist with the WirelessHART Note 5) standard and a way to coexist with communications such as Wi-Fi Note 6), an asset tracking WG, and a WG that defines a power supply interface for wireless devices. These WGs cover activities required for using wireless communication for industrial automation. As a result of the activities, in September 2009, the ISA has published the ISA100.11a wireless communication standard for industrial automation. As a founding board member of the ISA100 Committee, the YOKOGAWA Group has been promoting its standardization, and also as a founding member of the ISA100 Wireless Compliance Institute (WCI) that disseminate the ISA100 standard, the Yokogawa Group is playing a central role in disseminating efforts, including development of a device certification environment to ensure ISA100.11a interoperability, development of implementation specifications, and support for product development. The WCI is a non-profit organization, which provides certification and verification support, and education and technical support related to ISA100, and it promotes the dissemination of the ISA100 by helping vendors and users reduce the time, cost, and risk for the development and adoption of ISA100 products. As a WCI board member, the YOKOGAWA Group, in cooperation with other companies, aggressively supports the WCI activities through developing test specifications, Device Descriptions (DD), Capability Files (CF), and Device Files (DF), and through developing and providing an ISA100.11a function test script and WCI test kits (Stack Conformance and Device Interoperability Test Kits). The YOKOGAWA Group will continue to help build relationships between the WCI vendors and promote the dissemination of the ISA100 by following up the established WCI certification environment, updating the test kits, and maintaining the WCI documentation. 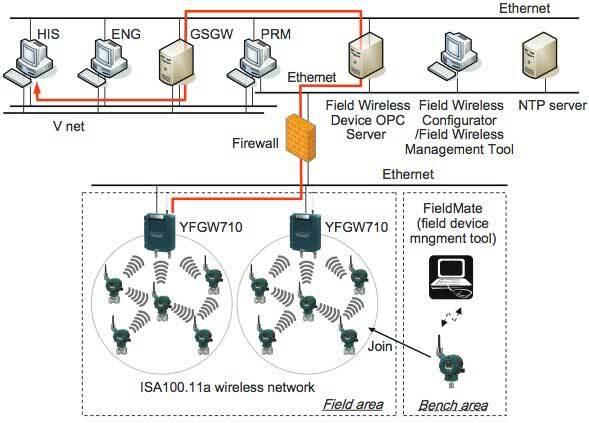 Figure 1 shows a typical field wireless system configuration based on the ISA100.11a. The wireless field device is a field device with wireless communication capability, and the gateway is an interface between the wireless network and applications, and has a gateway function for upper control systems such as a distributed control system (DCS). The backbone router has a function to interconnect between the wireless field devices and between a wireless field device and gateway. The system manager and security manager have functions to control and manage the behavior and security of the wireless network. As shown in the figure, it is possible to provide redundant paths between the controller and wireless field devices via multiple backbone routers, and also possible to provide multiple communication paths from the wireless field devices to the backbone router. The ISA100.11a defines the many basic functions to improve data arrival reliability in communication. Yokogawa is working on the wireless systems applying the ISA100.11a based on the following three basic principles. In the earlier days of field wireless communication, it was introduced to applications such as data logging and equipment maintenance and inspection where real- time quick responsiveness and high data arrival reliability in communication are not required. These applications correspond to Classes 3 through 5 in the usage classes by the ISA100 Committee shown in Table 1. In addition to the applications above, the ISA100.11a has basic functions and features suitable for implementing the wireless communication for the process control applications that require real-time responsiveness and robustness, which correspond to Classes 1 and 2 in Table 1. * Batch levels as defined by ISA SP88, where L3 = "unit" and L4 = "process cell"
Utilizing these functions and features, Yokogawa has developed the wireless infrastructure applicable to regulatory control of continuous process which corresponds to applications in Classes 2 through 5. Yokogawa will try to apply the basic functions and features of the ISA100.11a in order to achieve the periodic control of Class 1, which is a mission critical control class for continuous process. The ISA100.11a has various functions and features suitable for the real-time control and robustness. Major functions and features are as follows. Yokogawa not only takes advantage of these basic functions and features, but also prepares for the future; specifically, Yokogawa will develop redundancy for the backbone router, system manager and security manager, and optimization of the communication path and channel control. In addition to the wireless communication infrastructure, Yokogawa will try to develop control algorithms suitable for industrial wireless communication, and apply the wireless communication to the control process that requires more severe real-time control and robustness. The wireless field devices for field wireless systems use batteries to supply power in order to make best use of the advantages of wireless communication. This requires maintenance work for battery replacement. A great challenge is how to reduce power consumption for measurement and communication and increase their speed at the same time. The following describes the points of the development of built-in batteries and a battery case used in the wireless products. Lithium-thionyl chloride batteries were selected, because relatively accurate prediction of the remaining battery power is possible, they are commodities that can be easily procured in the market, and they are proven in the industry. A size D battery with the largest capacity was selected in order to increase the power capability which is important for high-performance field wireless systems. A battery case was developed so that batteries can be replaced in explosion hazardous areas. Yokogawa plans to develop, in the future, a power supply technology known as energy harvesting utilizing energy sources such as solar power, temperature differences and vibrations, and increase maintenance efficiency. The performance and quality required for customers' plants change according to the needs of the customers even after the operation is started. Furthermore, field wireless- technologies are advancing day by day, and the incorporation of its results into products extends the range of applications. It is important to continuously improve the performance and quality in an appropriate manner in response to such changes without wasting assets such as communication infrastructure which the customer invested in the control system. Yokogawa will provide products that make such continuous development possible and will continue to develop and introduce new technologies enabling new applications. Previously, a field device and a controller, or two field devices were connected with a physical wire. On the other hand, the use of a wireless system makes it possible to respond to changes in the system configuration by changing the network configuration through software, eliminating the necessity of physical wiring changes. The ISA100.11a system comprises components such as a backbone router and a system manager. These components are designed as function modules in a function-oriented manner. This design concept makes it possible to respond flexibly to changes in requirements for the performance and scale by adding or removing these function modules. Thus it is possible to respond to changes in requirements for the performance after installation and expand the scale without reconstructing the existing system. 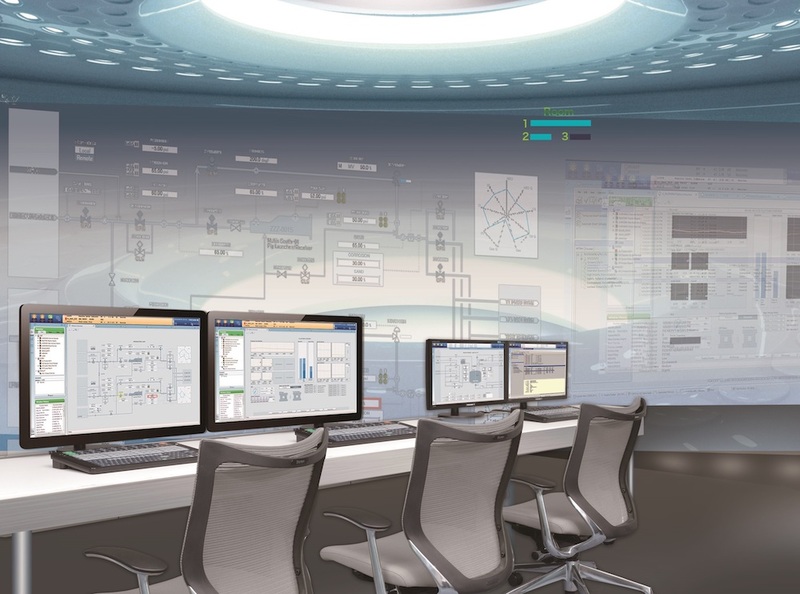 Yokogawa focuses on not only communication protocols for process automation such as FOUNDATION Fieldbus, HART, and PROFIBUS, but also those for factory automation or the like and those new in future. 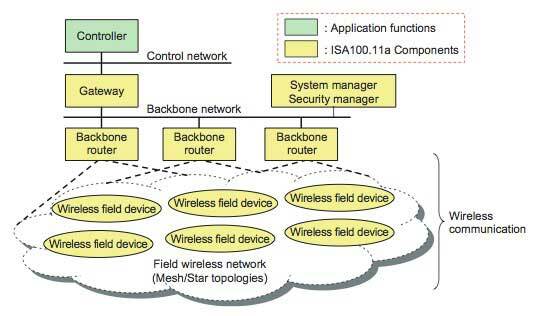 In a large-scale field wireless system as shown in Figure 1, the backbone network based on the ISA100.11a standard interconnects among a group of wireless field devices and between these and controllers. There are a variety of backbone network media of choice to respond to requirements such as increasing distance, speed, and generalizing usage. The newly released wireless device integrates the functions for the gateway, system manager, security manager and backbone router, and the system has no backbone network. However, it is a great advantage to be able to utilize a variety of information technologies such as Wi-Fi communication in plants, and Yokogawa is considering introducing the backbone network with such new technologies incorporated. At present, the ISA100.11a adopts the low-cost and low- power consumption IEEE802.15.4 short-range wireless communication standard as the physical layer. However, the ISA100 allows adoption of other standard with well–suited performance and reasonable cost according to the usage and technological innovation, including keeping up with wireless technology advancement and adopting wireless communication protocols with different characteristics. Yokogawa is also considering the change of the physical layer standard or addition of functions on it. Field wireless technology is still in the infant stage and is expected to develop much further in the future. To contribute to this development, Yokogawa will incorporate the new functions and features in products and also actively take part in the improvements in the ISA100 standard. A field wireless system allows installation of field devices at low cost in an area where wiring used to be impossible for physical and cost reasons, making it possible to expand the range of operation, monitoring, and device management from the central monitoring room. Thus it helps reduce field work, resulting in a reduction in the operation and maintenance costs. Connection of a field wireless system with CENTUM VP allows the operator to monitor the process data of wireless field instruments on the CENTUM VP Operation and Monitoring Windows. It also allows the operator to monitor anomaly in wireless field instruments and on the wireless network by means of alarms. 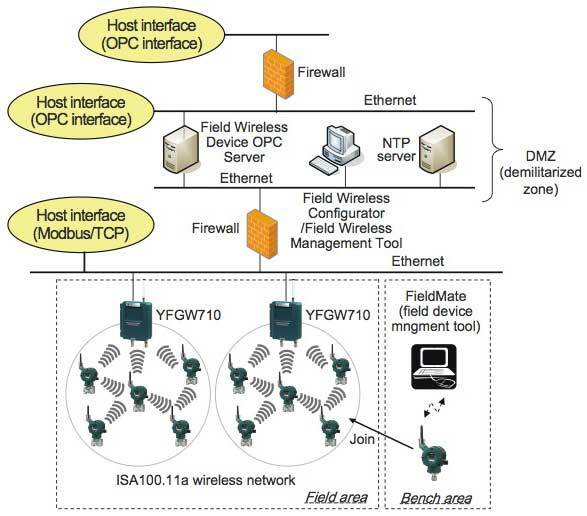 There are two ways to connect a field wireless system to CENTUM VP: one way is to connect to a field control station (FCS) and the other is to connect to a generic subsystem gateway (GSGW). When connecting to a FCS, the YFGW communication package (for ALE111) is installed in the FCS, and it communicates with a Field Wireless Integrated Gateway using an Ethernet communication module (ALE111). When connecting to a GSGW, the OPC server for field wireless system (Field Wireless Device OPC Server) is required. Figures 2 and 3 show system configurations for each connection. The red line shows a communication path for monitoring wireless field instruments. The following describes the main system components. 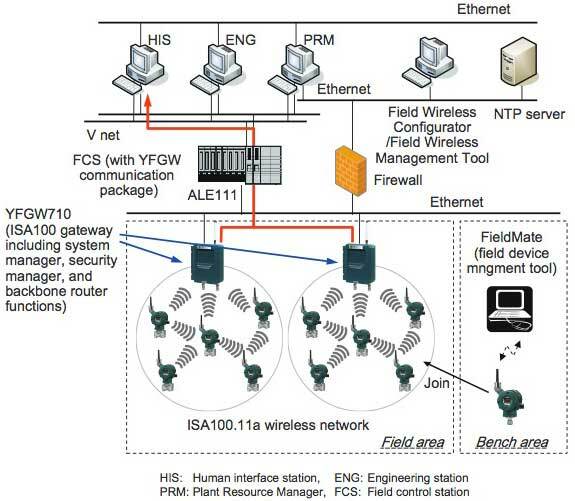 The newly developed YFGW710 Field Wireless Integrated Gateway has a gateway function to connect the wireless field instruments with the host system, and has the function of the system manager, security manager, and backbone router specified in the ISA100.11a. Communication with the upper system utilizes a Modbus/TCP protocol, the Modbus protocol Note 7) implemented on top of the Ethernet TCP/IP protocol. Field Wireless Configurator and Field Wireless Management Tool supplied with the YFGW710 are used to build and manage a field wireless network. The PC on which the software is installed is connected to the YFGW710 via Ethernet communication. Yokogawa released a differential pressure/pressure transmitter EJX B series and a temperature transmitter YTA510. For details, please refer to the report entitled "World's First Wireless Field Instruments Based on ISA100.11a" in this special issue. The FieldMate Versatile Device Management Wizard3 is software for setting parameters to field instruments. In field wireless systems, in addition to parameters which used to be set to the field instruments before, parameters to configure so that they can join the field wireless network are set to them. This function has been added to the existing FieldMate in relation with the development of the new field wireless system. FieldMate sets parameters to the wireless field instruments using infrared data communication. The NTP server manages the time of the field wireless system. Since a field wireless system requires the accurate management of time, it is recommended to connect an NTP server to the system. The PRM4 is a software package for managing field instruments and devices online. A field wireless system allows operators to monitor and manage the field wireless instruments, and set parameters to them. This functionality has been added to the existing PRM in relation with the development of the new field wireless system. This server software has been developed for dedicated use in the field wireless system that provides an interface based on the OPC standard interface developed by the OPC Foundation (OPC: OLE for Process Control). Combined use of this server software and the Field Wireless Integrated Gateway can connect the field wireless system to the host system through OPC interface. This communication software package is downloaded to a FCS and used to connect the field wireless system to CENTUM VP FCS (subsystem communication). ALE111 and the Field Wireless Integrated Gateway are connected via Ethernet and communicate to each other using the Modbus/TCP protocol. Duplex redundant configuration is available for ALE111. Figure 4 shows host interfaces for accessing the wireless field instruments. As described before, the Field Wireless Integrated Gateway YFGW710 provides a Modbus/TCP interface and allows devices and systems that support Modbus/TCP to easily access the data of the wireless field instruments. For example, Yokogawa's STARDOM FCN and FCJ autonomous controllers and DAQSTATION DX2000 Series network data acquisition stations support the Modbus/TCP interface and are able to access the data of the wireless field instruments. The Field Wireless Device OPC server enables connection through an OPC interface, and this extends the range of access. It allows OPC clients, such as Yokogawa's SCADA software FAST/TOOLS, to monitor the process data and access the device parameters of the wireless field instruments. It is recommended to install the OPC server in a demilitarized zone (DMZ) protected by firewalls on both sides, in order to prevent illegal access to the control system from the field area, or conversely guard the wireless network against illegal access from the control system. Yokogawa's design principles for the engineering environment are to reduce the engineering cost and lead time for building field wireless systems, and simplify the maintenance after the operation is started. The following describes the typical engineering required for building field wireless systems. In order to ensure the security of the wireless network and enable the instruments to join the wireless field network without disturbing the working system, the joining procedure of the instruments was designed as follows; first, the person in charge sets the parameters for the wireless field instruments offline, and then joins them to the network. Not only the parameters used to be set to field instruments before but also the information required for the instruments to join the wireless network are set in advance in order to prevent data falsification or impersonation by a third person. These settings are performed using the FieldMate installed on a PC connecting the field wireless instruments through infrared data communication. Instruments to which this information is not set or wrong information is set are not allowed to join the wireless network. The components comprising a wireless network, namely YFGW710 and individual wireless field instruments that communicate with it, need to be registered in all these components. This work is performed using the Field Wireless Configurator supplied with the Field Wireless Integrated Gateway. The host system requires the engineering to access the wireless field instruments through the Modbus/TCP interface or OPC interface. Both the Modbus/TCP interface and OPC interface are widely used, so the engineering functions for the interfaces are already available in many devices and systems. No special tools are required to perform the same engineering as before. Yokogawa's business includes not only control systems, control devices and field instruments, but also measuring instruments and solutions utilizing wireless measurement. Based on these technological assets, while keeping up with rapidly advancing wireless technology, Yokogawa supports customers in a wide range of areas from system building to solutions and over a long range throughout the entire plant lifecycle. As part of these efforts and as the first attempt to apply the wireless technology to plant control, in June 2010 Yokogawa released the world's first wireless field instruments and a device for wireless systems based on ISA100.11a. In addition, Yokogawa added functions to CENTUM VP to enable building systems using these instruments and the device, and released the OPC server for field wireless system. Yokogawa expects to be able to help customers improve productivity by providing a new field digital network that organically integrates field devices by making best use of the wireless and existing wired technologies. Yokogawa will continue to develop products while focusing on the application of wireless communication to continuous process control which requires advanced control technology. EJX, YTA, YFGW, and CENTUM are registered trademarks of Yokogawa Electric Corporation. FOUNDATION Fieldbus, HART, PROFIBUS, Wi-Fi, MODBUS, and Ethernet are registered trademarks of Fieldbus FOUNDATION, HART Foundation, PROFIBUS & PROFINET International, Wi-Fi Alliance, AEG Schneider, and XEROX Corporation, respectively. Note 1) A communication protocol proposed by Yokogawa in which digital signals are overlaid on the 4-20 mA analog signals. Note 6) Abbreviation of Wireless Fidelity, indicating that the interconnectivity between wireless LAN devices is certified by Wi-Fi Alliance.